Securing stable and long-term financing for compliance investments. To achieve long-term compliance with the requirements of European Union legislation in the water sector, as stated in the Kosovo Water Strategy, €1.1 billion will have to be invested in the water sector over the next 20 years. This represents an annual capital expenditure of €55 million, or at least twice the current funds dedicated to investments. Increasing water utility billing collection. An improvement in the cash collection ratio of water companies would increase revenues by 50%. Moreover the current tariff levels burden the budgets of disadvantaged social categories. This threatens the financial sustainability of water utilities which are unable to collect payments from 15% of residential customers belonging to those social categories. Improving the efficiency of utilities to enhance their sustainability. Water utility efficiency is currently limited by reduced revenues and increased operational expenses. Improving efficiency could significantly improve the sustainability of utilities by decreasing operational expenditures and providing additional funds for asset renewal and investment. Gov. KS. 2014. Kosovo National Water Strategy Document 2015 - 2034. Pristina: Government of the Republic of Kosovo. MMPH. 2004. Environmental Strategy and Sustainable Development for Kosovo. Pristina: Ministry of Environment and Spatial Planning of the Republic of Kosovo. WWRO. 2013. Annual Performance Report of Water Service Providers in Kosovo, in 2013. Pristina: Water and Wastewater Regulatory Office of the Republic of Kosovo. Economy. Kosovo is a lower-middle-income country and among the poorest in Europe, with a poverty headcount ratio of 6.8% (KAS 2011b). Kosovo is, however, among the few countries that have shown resilience since the 2008 economic crisis, with sustained economic growth of around 3% (Gov. KS 2014). This growth is due to the country’s macrofiscal stability and to the implementation of ambitious capital infrastructure spending programs. Kosovo is a small country (10,908 km2), with 1.8 million inhabitants (World Bank 2015), among which Roma, Ashkali, and Egyptian minorities face many difficulties. Remittances from the diaspora have played an important role in maintaining a sustainable economic environment by supporting household incomes and domestic demand. However, with a reported unemployment rate of 30% and a youth unemployment rate of 55.9%, the economic climate has not proved sufficient to improve the overall socioeconomic situation (Gov. KS 2014). Despite declared policy aspirations of the Government of Kosovo, the country is not yet an EU candidate. Five EU member states still have not recognized the independence of Kosovo, which is one of the stumbling blocks to further EU integration. The integration process officially began in March 2003, when the Stabilization and Association Tracking Mechanism (STM) between Kosovo and the EU was signed. Negotiations on the Stabilization and Association Agreement between the EU and Kosovo started in October 2013, and were completed in May 2014 (MMPH 2014). Governance. Kosovo is a parliamentary republic defined under a constitution adopted in 2008, after the country declared independence. Its administration is organized at the national and local levels. The country is divided into 7 districts and 38 municipalities (KAS 2014). The municipalities are responsible for local public services, and the responsibility for the provision of water supply and sanitation services is shared between the central and local governments (Law 2012/04-L-147 on Kosovo Waters). Water resources. With 1,600 m3/capita/year, Kosovo has limited renewable internal freshwater resources (MMPH 2004). To partly address hydrologic constraints, Kosovo has developed five large reservoirs (Badovci, Batllava, Gazivoda, Përlepnica, and Radoniqi), which are used for water supply, irrigation, industry, and hydropower generation. Groundwater reserves are limited and are located mainly in western Kosovo. Climate change projections indicate that climate variability will increase, with warmer temperatures and increasingly irregular precipitation, giving rise to an increase in water demand, droughts, floods, and forest fires. The recent precipitation deficit, with less than 50% of the baseline inflow, has already caused a dramatic drop in accumulations in the Batllava, Badovci, and Përlepnica reservoirs, seriously endangering the water supply for the central and eastern parts of Kosovo. Climate change factors are causing increased concern about adequate flood protection in Kosovo. According to the assessment contained in the Water Master Plan of 1983, a 1,000-year flood event could have profound impacts on river basins (the Drini i Bardhë River basin, the Ibri River basin, the Lepenci Basin, and the Morava e Binçës basin). This assessment concludes that about 491 km of rivers are threatened by flooding in Kosovo, but only 28% is regulated (MMPH 2014). Water supply sources. Sixty percent of the drinking water in Kosovo comes from surface water (ICPDR 2015). The five reservoirs in use have a current total capacity of 500 Mm3. The quality of raw water from surface water in Kosovo is generally moderate, since the water is abstracted from artificial reservoirs. Some water sources are reportedly polluted or potentially endangered by organic contamination due to lack of wastewater treatment, neglected maintenance of the sewerage system, intensive deforestation, or agriculture. The main rivers downstream of big municipalities and industry, especially downstream of Priština, the capital, are so polluted that the water cannot be used as a source of water supply, and in some places, not even for irrigation. The main polluters of the surface waters are municipalities and industries. Municipalities and communities discharge their wastewater without treatment. There is no precise information on groundwater extraction capacity. As a result of unfavorable hydrological conditions, underdeveloped water resources, and increasing service demand, the country faces quantitative shortages (MMPH 2014). Service provision. Provision of water and wastewater service is the responsibility of Regional Water Companies (RWCs). RWCs are licensed and corporatized public service providers. Whereas the central level owns and administers these providers, municipalities exert control over them through the appointment of utility board members. 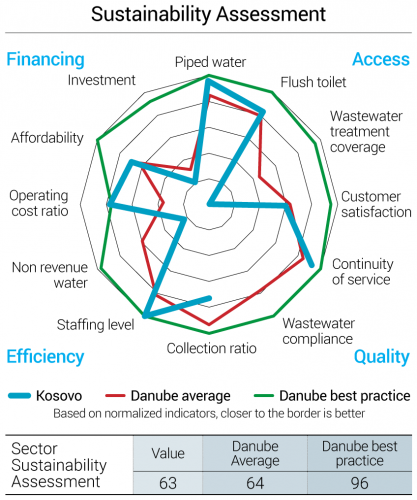 With 7 operating regional wastewater companies serving 67% of the population, the water sector in Kosovo appears concentrated compared to other countries in the Danube region. The rest of the population (33%) is supplied from water systems managed by communities (nonpublic systems) or individual systems (Figure 1). 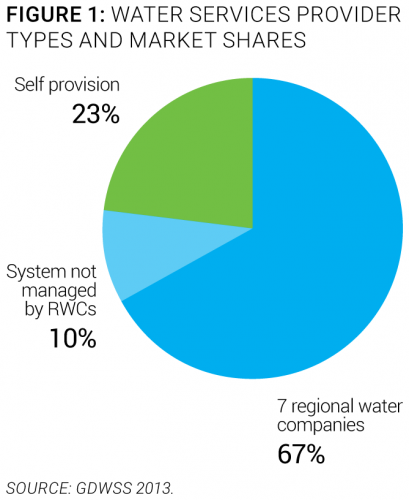 Community-run systems are present in cases where their planned integration within an RWC is not yet completed or when the community itself resists integration, mostly on tariff grounds. The study identified many issues related to community-run systems, such as strong financial constraints and low collection ratios, resulting in low maintenance efforts, deterioration of substandard infrastructure, absence of water quality monitoring, and lack of trained staff (Skat 2010). The Ministry of Environment and Spatial Planning, which is responsible for management and administration of Kosovar water resources, which include drafting laws and sublegal acts, development of policies and strategy, issuing and monitoring water rights, protection of water resources, and inspection (MMPH 2015). The Ministry of Economic Development, through its Policy and Monitoring Unit and the Board of Directors of water companies, is responsible for administration of Regional Water Companies. Whereas Policy and Monitoring Unit staff are ministerial staff, the Board of Directors is composed of experts appointed by the ministry for a three-year period following a competitive process, with applications and interviews. Half of the members, including the chairman, represent the ministry, and the rest represent serviced municipalities (MZHE 2015). The Water and Wastewater Regulatory Office, which is responsible for the economic regulation of the water sector. Regulation includes licensing of water companies, tariff setting, setting minimum service standards, and monitoring of customer protection. The director and his or her deputy are appointed by Parliament, whereas the rest of the staff involved in sector regulation are permanent personnel (WWRO 2015). The Inter-ministerial Council for Waters, which is composed of seven members from four line ministries and is chaired by the prime minister of Kosovo. The council provides opinions on and recommendations for laws and other sublegal acts relating to water management and their implementation, drafting and approval of the National Water Strategy, and policy development in the field of water (KNMU 2015). The National Institute for Public Health (NIPH), which is responsible for monitoring drinking water quality. NIPH is part of University Clinical Center of Kosovo and has contractual arrangements with water companies for monitoring drinking water quality (NIPH 2015). Capacity and training. Stakeholder capacity has improved significantly, but further enhancement is needed, especially in technical areas. In recent years, stakeholders have gained competence and expertise in areas such as operational management, corporate governance, economic regulation, policy planning, and service compliance. Despite evident progress, further enhancement of capacities is needed, especially with respect to service providers and in the fields of efficiency improvement, capital investment planning, and service compliance. According to the 2013 Household Budget Survey published by the Statistical Agency of Kosovo, the average monthly wage in Kosovo is €336, which is considerably less than the average monthly wage of employees in RWCs (€517) (KAS 2013). A high remuneration level combined with a high unemployment rate makes employment in water utilities attractive. The workforce reluctance to leave water utilities, and the limitations on new staff recruitment for efficiency reasons, considerably reduce staff turnover. Despite positive developments in recruiting qualified personnel, a majority of staff have only secondary education. Given the need to address imminent efficiency challenges, such as nonrevenue water (NRW) reduction, cost efficiency improvement, and sustainable asset management, enhancing the qualifications of utility staff is a necessity. For now, donor projects play the main role in capacity building of utility staff. The water and wastewater association of Kosovo, SHUKOS, established in 2001, also aims at developing more structured training and capacity-building programs. Economic regulation. Since 2002, economic regulation has been under the umbrella of a dedicated Regulator for Water and Wastewater Services. Tariffs for water and wastewater service are regulated by the Water and Wastewater Regulatory Office. The tariff-setting process is carried out once every three years according to the Regulator’s guidance. The approved tariffs cover a three-year period and are reviewed in the second and third year. Service providers estimate tariffs and investment plans following a specific process, and submit their request for approval to the Board of Directors. Following the board’s endorsement, these tariffs are submitted for final approval to the regulator. The tariff-setting process is carried out among service providers, the regulator, and customer consultative committees. In principle, tariffs should provide adequate recovery of operating expenses and investments on the one hand, and remain affordable for serviced customers, on the other hand. To simulate market conditions and promote performance improvement, the regulator imposes on service providers the achievement of targets in terms of water production, water billed, nonrevenue water, operating expenses, billing, etc. In practice, service providers fall short of meeting some revenue targets (20.3% of providers), collection rates (23.2%), and investments (52.8%), but exceed committed targets for other indicators, such as NRW (6.1%) and operating expenses (25.6%). If service providers successfully reach performance targets, they are entitled to benefit from tariff adjustments (WWRO 2015). To simulate market conditions for a natural monopoly service provider, the regulator imposes the achievement of specific performance targets. Targets refer to water production, water billed, nonrevenue water, operating expenses, billing, etc. These targets are also embedded in the tariff estimations. Water companies are incentivized to reach these targets, since they can adjust their tariffs for the inflation factor. Ongoing or planned reforms. 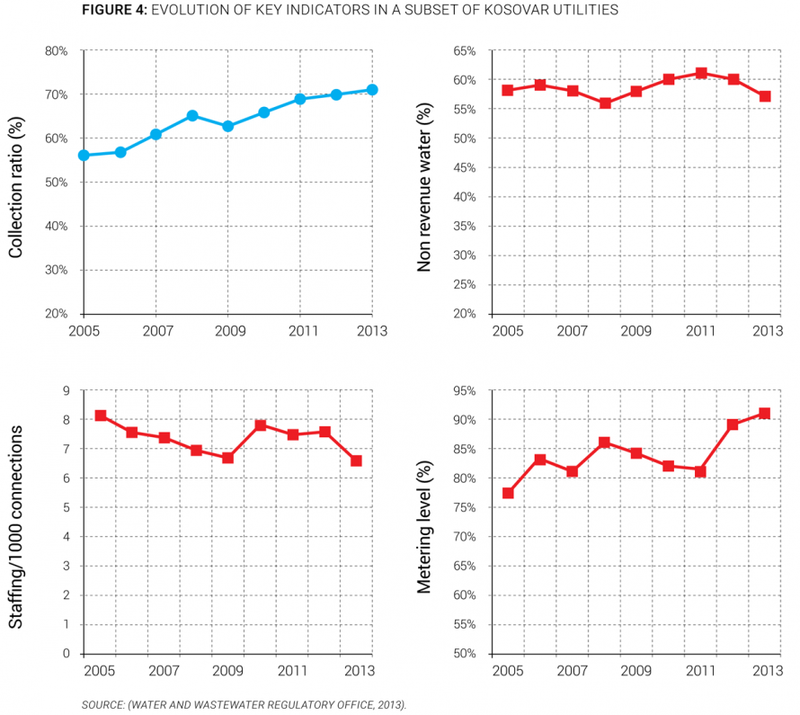 The Kosovo utility sector completed implementation of structural reforms during 2000-2007. As a result, no further reform needs have been identified. Emphasis is now on strengthening the implementation of framework obligations, with a special focus on sector sustainability and performance improvement (WWRO 2015). Service coverage. The vast majority of the population of Kosovo has access to safe water and sanitation services. Ninety-six percent of the population has access to piped water service within their dwellings (Figure 3). Only 4% of the population has no access to piped water systems. Water service is provided by public companies (67%) and by independently operated systems (10%). The remaining households (23%) are supplied by individual systems. 53% of the population is covered by public sewage and wastewater collection. 84% of the population has access to improved sanitation services. Wastewater treatment covers 1% of the population and is provided by public service operators (Expert estimate). Service coverage differs in urban and rural areas; 100% of the urban population has access to a public water supply compared to 66% of the rural population, and 60% of the urban population has access to public wastewater service compared to 42% of the rural population (WWRO 2013). Equity of access to services. Compared to urban inhabitants, rural inhabitants have lesser access to public water and sewerage services, and poor households encounter hardships paying water bills. Access to public service in Kosovo is unequal between urban and rural areas due to historical reasons, though the situation is continuously improving thanks to sizable infrastructure investment. Moreover, 84% of the poorest segment of the population (living on less than $2.50/day) has access to piped water supply and 76% to flush toilets (Authors’ elaboration). Affordability remains a serious concern for the poorest segment of the population, however, especially since there is no water bill exemption or assistance scheme in place for these populations. There is no statistical information available regarding access to water and sanitation for marginalized minorities. Sources used in compiling the statistical information on water services for this report include the 2011 census conducted by the Statistical Agency of Kosovo, the Kosovo Water Strategy 2014-2033, Annual Performance Reports issued by the Water and Wastewater Regulatory Office, Historical Investment Trends in the Water Sector in Kosovo, and the Coverage Study and Assessment of Water Supply and Sanitation Systems in Kosovo. Service infrastructure. The water infrastructure is relatively well developed, yet the situation for wastewater is not satisfactory. Thanks to persistent investments, the old and obsolete water network infrastructure is being replaced, with continuous improvements in that respect. The wastewater network is half the length of the water network, and substantial investment is needed to improve it. The most critical situation, though, relates to the wastewater treatment service, for which the infrastructure is inadequate (WWRO 2013). Quality of service. Water service quality is relatively good, with further possible improvement. Yet the lack of wastewater collection, and especially treatment infrastructure, affects the quality of wastewater service. According to the 2013 performance report, microbiological compliance for the whole water sector was 98.4%, and physical-chemical compliance rose to 97% (WWRO 2013). In most cases of breach, bacteriological water quality has been downgraded by the presence of coliform and e-coli. Service continuity in 2013 was 22 hours/day (WWRO 2013). Customer satisfaction. Customer satisfaction surveys are conducted yearly. It is mandatory for each public water company to conduct an annual customer satisfaction survey and to report the outcomes to the Ministry of Economic Development. The results of the 2013 survey show 40% of customers are very satisfied with service, 43% are satisfied, 14% are moderately satisfied, and only 4% are not satisfied (MZHE 2015). According to the Gallup international poll, 60% of the Kosovar population is satisfied with the water service provided. This rate is lower than other countries in the Danube region (Gallup 2013). Overall efficiency. The efficiency of service providers is moderate, with significant room for improvement. Despite steady improvements in recent years, efficiency gains can still be made. For instance, nonrevenue water levels in 2013 reached 57%, negatively affecting service costs and service level (WWRO 2013). This high level of NRW is due to a combination of factors including outdated infrastructure, outdated metering devices, data-handling errors, and water misuse. Staff productivity in 2013 was 6.6 employees per 1,000 connections (WWRO 2013). The billing collection rate was 71%, revealing internal utility inefficiencies and unresolved affordability issues with customers (WWRO 2013). Recent trends. Efficiency of water and wastewater utilities is improving, but at a modest pace. Implementation of a performance monitoring platform in Kosovo in 2005 has enabled tracking and monitoring performance development of water and wastewater utilities. During 2005-2013, the billing collection ratio and the metering level increased steadily, allowing better measurement of water consumption and generation of more revenues for utilities. However, other indicators, such as NRW, showed no efficiency gains (Figure 4). The staffing level and operating ratio remained stable, with limited improvement. As a result, operations costs still prevent further efficiency gains (WWRO 2013). Overall sector financing. Tariffs fully cover O&M expenses but the sector relies on external funding for capital investment. Water and wastewater utilities are organized according to self-financing principles (application of cost recovery tariffs). Yet due to inefficiency, service providers cannot recover O&M expenses, which must be complemented by subsidies. The municipal service Mitrovica receives local subsidies to cover its O&M expenses. 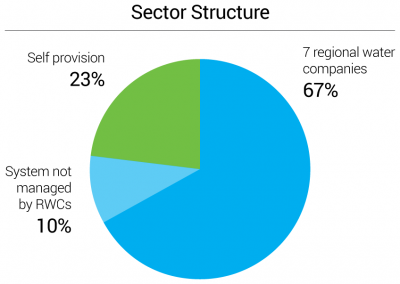 Investments represent 77% total sector spending and are funded through transfers and national taxes fund (Figure 5). 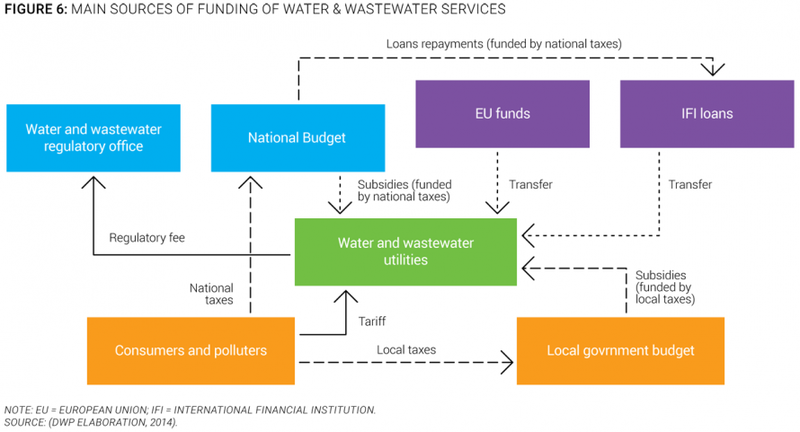 Figure 6 graphically displays the main sources of funding of water and wastewater utilities, using the OECD’s three Ts methodology (tariffs, transfers, and taxes). Investment needs. Investments in the water and wastewater sector are substantial, but are still insufficient to meet demand. In the Kosovo Water Strategy, investment needed are estimated to exceed €1 billion over the next 20 years, which represents a total effort of 17.3% of GDP and a yearly effort of 0.86% of GDP. Investment needed for water amounts to €350 million—€128 million for extension of water supply, €93 million for drinking water treatment, and €143 million for rehabilitation of the existing network. Investments needed for wastewater amount to €740 million, including €300 million for sewerage extension, €220 million for wastewater treatment, and €220 million for rehabilitation of existing sewers. To meet these needs, investment needs to be doubled over the projected period to €29/capita/year (Gov. KS 2014). Investments. The main funding for investments comes from donors, international financial institutions, and the government, with modest contributions from utilities. Since the end of the conflict in 1999, more than €250 million has been invested in the water and wastewater sector, representing €17/capita/year and 0.3% of GDP per year. Seventy-four percent of those investments were funded by international donor institutions and 26% by the central government budget through taxes. Since 2009, the funding scheme has been more balanced, with a noticeable increase in the government’s contribution to 54%, a decline in donor grants to 42%, and water company funding of 4% of all investments (Figure 7). Tariffs. Since 2006, Kosovo has set tariffs according to cost recovery principles, supervised by a regulator. Since 2006, tariffs have been designed according to sound economic principles and are set for one year. Three tariff-setting reviews have been carried out—during 2007-08, 2009-11, and 2012-14. Tariff structures for both water and wastewater service contain a standing fee and a volumetric charge. These fees can be set at different levels in each of the 7 water utilities, and water price can differ depending on customer type (residential, commercial, or institutional). For instance, the standing fee amounts to €1/month for residential customers and €3/month for commercial and institutional customers. Tariffs as set by the regulator are supposed to cover running and capital costs. In practice, however, due to problems in billing collection and low cost efficiency of utilities, they hardly cover O&M costs, falling short of securing adequate capital funds (WWRO 2013). Affordability. Water and sanitation services are affordable for a majority of the Kosovar population, except for poor households. The mean water and sanitation invoice represents 2.3% of household average income. But this ratio amounts to 3.4% for households in the 40% of monthly income connected to public service (Figure 8). The situation is further aggravated for social categories that are not exempt from water bills and receive no supporting subsidies. During 2001-07, Kosovo embarked on water and wastewater utility sector reforms. Small municipal companies offering water and wastewater services in addition to other municipal services underwent an unbundling transformation process. Establishment of the Water and Wastewater Regulatory Office in 2004 complemented the reform process. Seven regional water companies were then established according to commercial principles, with clean-cut assets, consolidated accounts, and two management levels. To evaluate and reflect the sustainability of services in the region, an overall sector sustainability assessment was conducted taking into account four main dimensions: access to services, quality of services, efficiency of services, and financing of services. Each of these dimensions is measured through three simple and objective indicators. For each indicator, best practice values are established by looking at the best performers in the region, and countries closest to those best performers are deemed to have a more mature sector. A more complete description of the methodology to assess sector sustainability is included in the Annex of the State of the Sector Regional Report from the Danube Water Program. 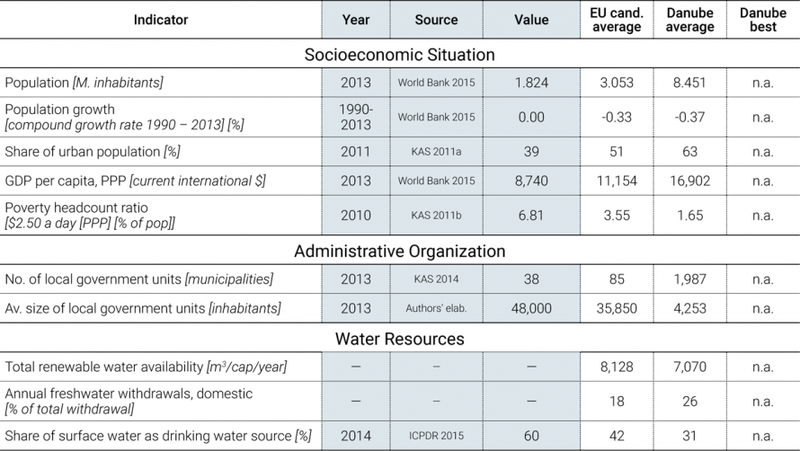 The outcomes of this assessment for the Kosovo water sector are presented in Figure 9, which also shows average and best practices in the Danube region. As a result, the Kosovo sector sustainability score is 63, which is close to the Danube average sustainability of 64. The assessment shows that, on average, the country performs well in terms of access to piped water and flush toilets, continuity of service, staffing level and operating cost ratio. The main deficiencies identified through the sector sustainability assessment are the investment level, nonrevenue water, and wastewater treatment coverage (Authors’ elaboration). Securing stable and long-term financing for compliance investments. Kosovo Water Strategy Objective No. 2.5 “Approximation of National Legislation with EU Directives” establishes the principle of “Achiev[ing] long-term compliance with the requirements of European Union legislation in the water sector.” To achieve this objective, €1.1 billion will have to be invested in the water sector over the next 20 years. This represents an annual capital expenditure of €55 million, or at least twice the current funds dedicated to investments (Gov. KS 2014). This will require an increase in utility internal funding sources and in government grants. Another option might lay in borrowing soft loans and attracting private investment. Increasing water utility billing collection. The Kosovo regulatory framework requires water companies to charge full-cost tariffs and that no customer is exempt from water bill payment regardless of their social category. An improvement in the cash collection ratio of water companies would increase revenues by 50%. The current level of tariffs burdens the budget of disadvantaged social categories, which receive no assistance in paying their water bills. This situation threatens the financial sustainability of water utilities, since revenues from tariffs are used to recover operational costs. Indeed, water companies indicate that it is almost impossible to collect water bill payments from 15% of customers in the socially disadvantaged categories (Gov. KS 2014). Improving the efficiency of utilities to enhance their sustainability. Performance improvement of key indicators remains modest compared to historical trends. The existing level of efficiency is limited by reduced revenues and increased operational expenses. As a consequence, most utility cash is spent in recovering recurrent costs, with minimal O&M efforts, which adversely affects service quality. There is great potential associated with efficiency improvement, since nonrevenue water and energy cost reduction could decrease operating costs by 25%. This would result in a significant improvement of utility sustainability, with greater O&M efforts and additional available funds for asset renewal and investment (Gov. KS 2014). KAS. 2011a. Kosovo Agency of Statistics: Kosovo Population and Housing Census. Accessed 2015. https://ask.rks-gov.net/eng. —. 2011b. Results of Household Budget Survey. Pristina: Kosovo Agency of Statistics. —. 2013. Results of Household Budget Survey. Pristina: Kosovo Agency of Statistics. —. 2014. Kosovo in Figures 2013. Pristina: Kosovo Agency of Statistics. KNMU. 2015. The Office of the Prime Minister of the Republic of Kosovo - Inter-Ministerial Water Council. Accessed 2015. http://www.kryeministri-ks.net/tfu. —. 2014. Climate Change Framework Strategy for Kosovo. Pristina: Ministry of Environment and Spatial Planning of the Republic of Kosovo. —. 2015. Ministry of Environment and Spatial Planning of the Republic of Kosovo. Accessed 2015. http://mmph-rks.org. MZHE. 2015. Ministry of Economic Development of the Republic of Kosovo. Accessed 2015. http://mzhe.rks-gov.net. NIPH. 2015. National Institute of Public Health of the Republic of Kosovo. Accessed 2015. http://www.niph-kosova.org. Skat. 2010. Coverage and Sustainability Study of Rural Water Schemes in South Eastern Kosovo. St. Gallen: Swiss Resource Centre and Consultancies for Development. —. 2015. Water and Wastewater Regulatory Office of the Republic of Kosovo. Accessed 2015. http://www.wwro-ks.org. This note has been prepared by Ramiz Kokollari, local consultant, with the support of Maria Salvetti, consultant, based on the data collection by Ramiz Kokollari. It is part of a regional State of the Sector review led by David Michaud, World Bank, under the Danube Water Program financed by the Austrian Ministry of Finance, whose support is gratefully acknowledged. The authors welcome comments and can be contacted through David Michaud (dmichaud@worldbank.org).